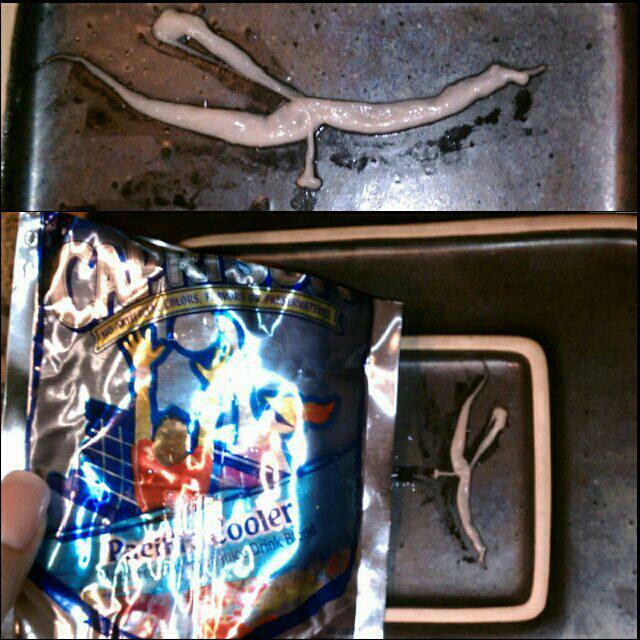 Tainted Capri Sun or Hoax? !! !ATTENTION PARENTS!!! I read on the internet yesterday that people were noticing that their CapriSun Drinks were filled with mold. Today my sister gives her son a drink and noticed the straw was immediately clogged. She calls me and shows me this horrible 'worm thing', I was disgusted! I cut open the package and right away you can smell that it was rancid. This is outrageous! Apparently, Kraft Foods knows of this mess but WON'T recall these drinks! Please avoid purchasing these until they take action on this! I am beyond pissed that this could have been consumed by either my niece or nephews! They better expect an extremely PISSED off Titi, cause they're getting an ear full! Re: Tainted Capri Sun or Hoax? This post refers to that one, but, I didn't see the first one. I've been having technical issues since I upgraded, lol! I think it's Apple & Eve I buy for my great niece and nephew. It's a combination of fruits and vegetables and in a clear bottle. They gave it to me after an endoscopy and I liked it. It would make me sick if I gave that to a child! Could be! I'm a date checker! Looks me like an aborted croc or alligator. It has what appear to be a head, tail and a leg. Creepy!